Greaves Cotton Limited, established in 1859, is one of India’s leading and well-diversified engineering companies. It manufactures a wide range of industrial products to meet the requirement of core sectors in India and abroad. 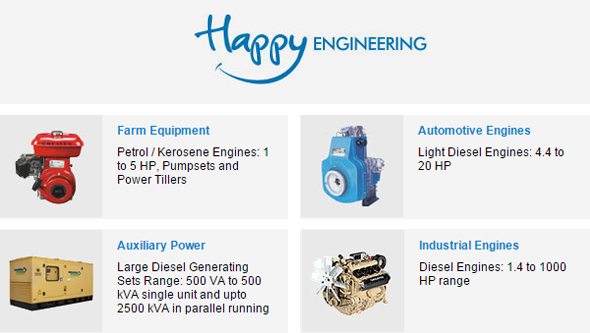 The Company’s core competencies are in Diesel / Petrol Engines, Gensets, Pumpsets and Construction Equipment. In the recent years, Greaves has made rapid strides towards globalisation. The Company exports several of its products to various countries. Greaves has 10 Manufacturing Units located all over India, with overseas offices in UAE, Tanzania and China. The Company’s manufacturing plants are equipped with state-of-the-art production facilities, backed by in house R&D. An extensive sales and service network manned by highly skilled and dedicated workforce keeps Greaves in touch with its customers anytime, anywhere.